Q &R: School of Love? Hello, Brian (or whomever is handling this message)! Eight years ago Question #6 in your book A New Kind of Christianity: Ten Questions that Are Transforming the Faith thoroughly hooked my interest. Ever since, I’ve worked on and read materials related to a church functioning as a ‘school of love’. 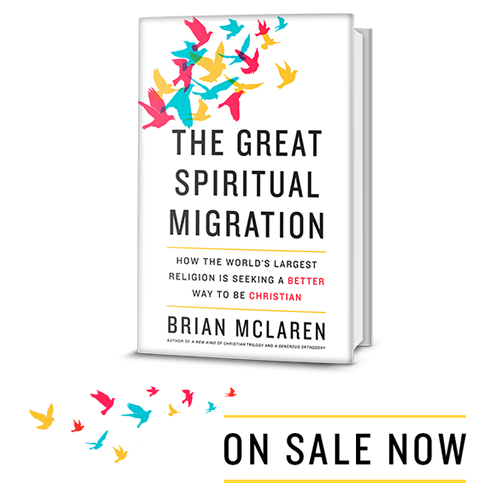 Then, recently, your newest book, The Great Spiritual Migration, was referenced in a Richard Rohr daily meditation; I promptly got a copy from our local library, finished reading it yesterday, and expect my copy from Amazon to arrive tomorrow. In this book you provide a very comprehensive response to the question about ‘a church functioning as a school of love’. I regret that it’s taken me more than a year to cross paths with the book. Question #1: Are you aware of and in touch with congregations in the USofA who (either inspired by your book, or on their own initiative) have such a ‘spiritual migration’ underway? And if so, how many such congregations are there? Question #2: Has any type of ‘information exchange’ among such congregations been established for sharing stories of success and/or failure, best- practices, etc. BTW – I am a long-time member of a 40-year-old congregation in northwest Austin, Texas, which bears the name Triumphant Love. My hope is that we’re a natural for participating in the type of migration you have so beautifully described. 2. Convergence/Center for Progressive Renewal is an amazing pair of organizations seeking to fill this gap. I’m on their board and am working with them to develop the Convergence Leadership Project, the Convergence Music Project, and other initiatives. Progress is slower than we’d like because so many congregations are “stuck” in denominational silos. My belief is that we need to build a multi-denominational movement of these forward-leaning congregations. Stay tuned!